Born in 1844 to a working-class family in Laval, France, Henri Rousseau worked briefly for a lawyer and served a stint in the military before taking a position at a French customs post in 1868; the nickname "Le Douanier" (the customs inspector) remained with him even after his retirement in 1893. Very poor, Rousseau was a self-taught painter who harbored dreams of official approval. Although he never achieved recognition from the French academy, he was embraced by early 20th-century avant-garde artists, including Picasso and the surrealists, for his departures from conventional style, which included broad, flat planes of color, stylized line, and fantastic landscapes. While he painted exotic locales, Rousseau never left France; his jungles are the dreams of a city dweller, constructed from visits to the botanical gardens, the Paris zoo, and colonial expositions, and culled from prints and reproductions. Tropical Forest with Monkeys was painted during the last months of Rousseau's life. It shows one of his signature exotic landscapes, lush, tropical, and virgin. Many of the animals in Rousseau's images have human faces or attributes. The central monkeys in this painting hold green sticks from which strings appear to dangle, suggesting fishing poles and human leisure activities, thereby emphasizing the quasi-human experience of the animals. 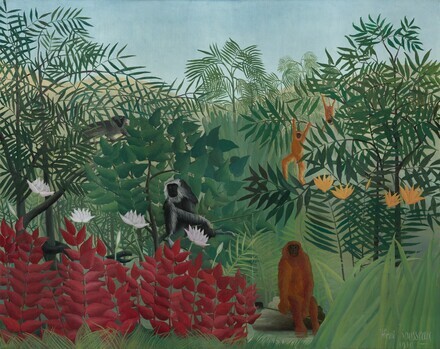 In this sense Rousseau's anthropomorphized primates can be seen not as true wild beasts, but rather as representing an escape from the "jungle" of Paris and the everyday grind of civilized life. In an age of colonial expansion and large-scale expeditions, the popular press was full of images of westerners at ease in the jungle. Rousseau, for example, kept in his studio the Bêtes sauvages album published by the department store Galeries Lafayette. One of the most striking aspects of Rousseau's style is the flattening of his subjects. Whether he was echoing his impressionist contemporaries, who were concerned with surface, or simply following his own vision, the artist's jungle paintings lack solidity, as if they were representations of theatrical décor, the gigantic leaves and petals minimally contoured so as to create the effect of overlapping cutouts. Moreover, his creatures seem deliberately subdued by a deadpan treatment that identifies each more as outline than as a tactile form. As his career progressed, Rousseau increasingly associated with the avant-garde, and in 1905 he exhibited alongside the Fauves at the Salon d'Automne. Gradually his reputation grew, and sales of his work had increased considerably by 1910, when he fell victim to an infection and died. His funeral was attended by Paul Signac and Guillaume Apollinaire composed a whimsical poem that Constantin Brancusi chiseled into the tombstone, thereby situating Rousseau an unwitting godfather of modernism. Paul von Mendelssohn Bartholdy, Berlin; his wife, Elsa Gräfin Kesselstadt, Berlin and later Vaduz; on consignment 1950 with (Walter Feilchenfeldt, Switzerland); by whom sold 1950 to John Hay Whitney [1904-1982], Manhasset, New York; deeded 1982 to the John Hay Whitney Charitable Trust, New York; gift 1982 to NGA. See letter from Walter Feilchenfeldt dated 21 October 2000, in NGA curatorial files. New York Private Collections, Museum of Modern Art, New York, 1951. Paintings, Drawings and Sculpture Collected by Yale Alumni: An Exhibition, Yale University Art Gallery, New Haven, Connecticut, 1960, no. 84, repro. The John Hay Whitney Collection, Tate Gallery, London, 1960-1961, no. 51. Henri Rousseau dit 'Le Douanier', Galerie Charpentier, Paris, 1961, no. 79, repro. The John Hay Whitney Collection, National Gallery of Art, Washington, D.C., 1983, no. 28, repro. Henri Rousseau, Grand Palais, Paris; Museum of Modern Art, New York, 1984-1986. Impressionist and Post-Impressionist Masterpieces from the National Gallery of Art, Washington, State Hermitage Museum, Leningrad; State Pushkin Museum of Fine Arts, Moscow, 1986, no. 33, repro. Loan for display during première of ballet by Margo Sappington, performed by Milwaukee Ballet, with sets inspired by Rousseau paintings, Milwaukee Art Museum, 1987, no cat. Les Tentations de Bosch ou l'Éternel Retour, Museu Nacional de Arte Antiga, Lisbon, Portugal, 1994, no. 42, repro. Gifts to the Nation from Mr. and Mrs. John Hay Whitney, National Gallery of Art, Washington, D.C., 1998-1999, no cat. Henri Rousseau: Der Zöllner - Grenzgänger zur Moderne, Kunsthalle Tübingen, 2001, no. 58, repro. Henri Rousseau: Jungles in Paris, Tate Modern, London; Galeries nationales du Grand Palais, Paris; National Gallery of Art, Washington, D.C., 2005-2006, no. 27, repro. Loan to display with permanent collection, Musée du Vieux Château, Laval, 2007. Henri Rousseau, Fondation Beyeler, Basel; Museo Guggenheim Bilbao, 2010, no. 39, repro. Rewald, John. "French Paintings in the collection of Mr. and Mrs. John Hay Whitney." The Connoisseur 134, no. 552 (April 1956):136, repro. Bouret, Jean. Henri Rousseau; Catalogue raisonne. Neuchatel, 1961: no.48. Vallier, Dora. L'opera completa di Rousseau il Doganiere. Paris: Flammarion, 1970. European Paintings: An Illustrated Catalogue. National Gallery of Art, Washington, 1985: 359, repro. Kopper, Philip. America's National Gallery of Art: A Gift to the Nation. New York, 1991: 296, color repro. Southgate, M. Therese. The Art of JAMA: One Hundred Covers and Essays from The Journal of the American Medical Association. St. Louis, 1997: 146-147, 212, color repro. Hand, John Oliver. National Gallery of Art: Master Paintings from the Collection. Washington and New York, 2004: 408, no. 338, color repro.